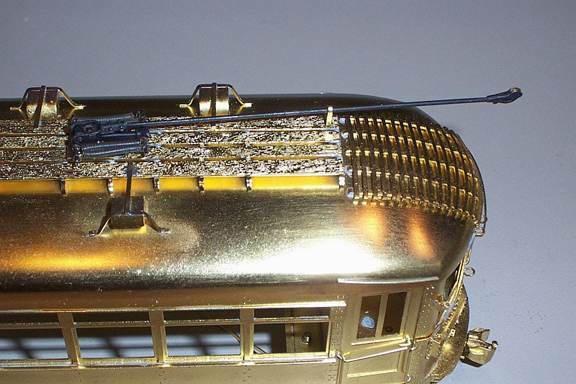 With resin roofs, a sleeve mount is very simple and straightforward, but how about using sleeves on brass cars in place of the commonly supplied nylon bushings? Most times, we have simply dug through the styrene box for whatever size tubing works insulate the 1/8" brass tube used for our sleeve (which is drilled out slightly to clear the #2-56 mounting screws on the Q-Car poles). But I've recently been working on an MTS 170-series North Shore coach which has pretty nice detail on the pole mounts. Drilling these out to 1/4" to accept a chunky styrene insulator seemed a shame, but I couldn't find any simple alternative. Until I went out for a drink. Those short, thin, mixed drink-sized straws (Figure 1) turn out to be exactly the right size to insulate a 1/8" brass tubing. Fabrication is very straightforward, with the sleeve length depending mostly on the roof thickness (Figure 2 ) and (Figure 3). 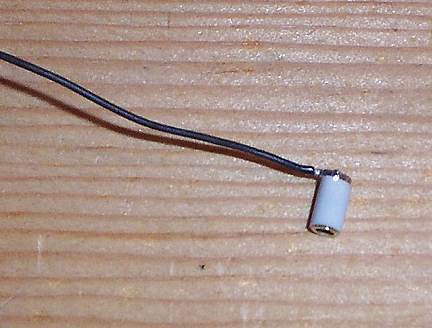 Allowing about 1/4" length seems to work well. 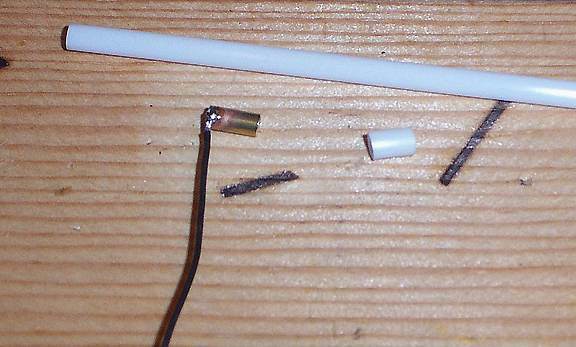 Naturally, soldering the lead wire on should be done before assembly, as the thin plastic straw isn't very heat resistant. The mounting hole on the car roof only has to be about 0.133" diameter, with just a drop of CA [ACC] to hold the sleeve in place (Figure 4). [5 minute epoxy could be substituted - editor.] Note that the sleeve is slightly raised to support the pole base slightly above the roof for clearance (and insulation, as the pole will dead short to the carbody along with wearing through the paint if it is rubbing). Contact will be even better if the very top of the sleeve is left unpainted. Thin as they are, the plastic straws are plenty thick enough to insulate the sleeve from the car body, and they are available in a variety of colors. 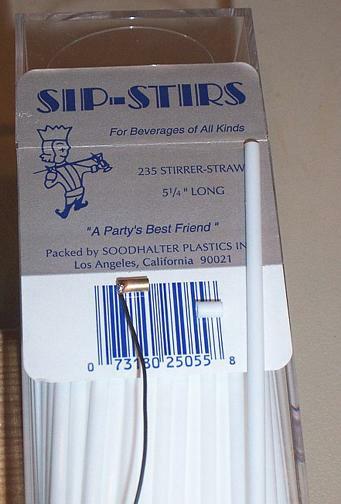 The price is certainly right, too; one drink provides a straw long enough to make about 20 insulators. We also like to cut 2-56 brass machine screws to make short threaded rods, which we screw into the threaded hole in a Q-Car poles (the North Shore style-B-131 is shown in (Figure 5). This photo also illustrates how easily the poles can be removed or exchanged. 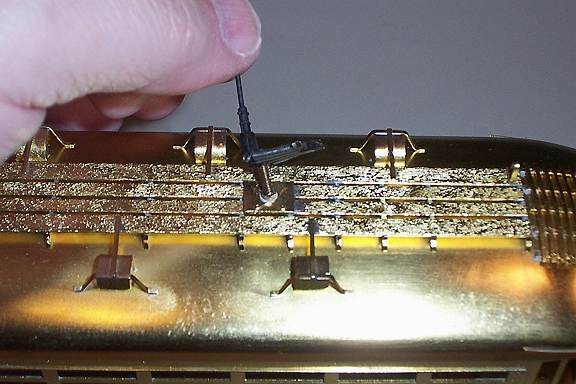 Just don't make the threaded part too short or the springs will be able to launch it and you'll be chasing the pole across the layout if it dewires. 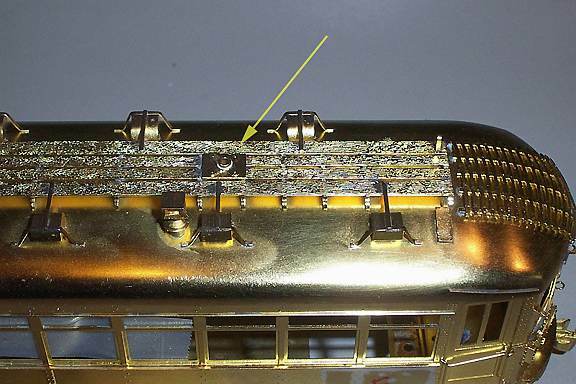 With a drop of black paint on the end of the threaded rod, the screw on the trolley pole becomes nearly invisible (Figure 6). Installed on the car, there is no hint of any difference in how the pole is mounted, save that a bent or "cranky" pole can be changed instantly to save an operating session without even using tools. Cheap and plentiful as they are, it looks like I have enough straws left in that one box for another 2,460 or so cars - double that if they're all single-ended! Unless a few get used for libations while construction is taking place. Rule G is not always strictly observed here at the 96th Street shops.